Meant to Live: What's the difference between bipolar disorder and sleep deprivation? What's the difference between bipolar disorder and sleep deprivation? Okay, okay, don't worry! This won't be a political post. 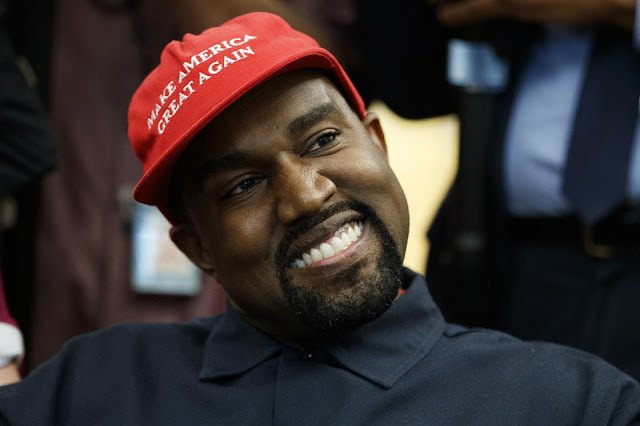 But I do write about mental illness, so when I heard about Kanye West delivering an "impromptu rant on mental illness" at the White House, of course I had to write about it. When I only read the headline, I was hoping that maybe Kanye used his platform at the Oval Office to spread awareness about mental illness. Instead, what he talked about was how, even though he was previously diagnosed with bipolar disorder, a doctor told him that it was a misdiagnosis. "I wasn’t actually bipolar. I had sleep deprivation which can cause dementia 10 to 20 years from now when I wouldn’t even remember my son’s name," he said. While many people have been left scratching their heads after Kanye and Trump's meeting, I do think it opens up an important conversation. And that is this: How do you know if you have a mental illness...or if it's something else? The symptoms of mental illnesses often mirror the symptoms of other illnesses or issues. For instance, a few weeks ago, I all of the sudden started dry heaving, my hands were freezing, my face was burning up and my brain felt fuzzy. I thought I was coming down with the flu. But then I took a Xanax, walked around the block, started to feel better and realized that, actually, I was having a panic attack. I think correct diagnoses are very important because, if you don't know what's wrong, you can't correctly treat it. Obviously if I would have taken some DayQuil when I was having a panic attack, it wouldn't have helped. So, what Kayne said made me curious. What is the difference between the symptoms of bipolar disorder and the effects of sleep deprivation? And does not getting enough sleep affect your mental state? Long-term sleep deprivation affects at least 10 percent of Americans. According to Healthline, chronic insomnia causes your central nervous system not to function properly. It leaves your brain exhausted so it's more difficult to concentrate, and it can negatively impact both short and long-term memory. It can also trigger depression, paranoia, impulsive behavior and suicidal thoughts. On top of that, it also weakens your immune system, affects your body's release of insulin and increases your risk of high blood pressure. Bipolar disorder affects 2.6 percent of the U.S. population each year, according to the National Institute of Mental Health. And, the truth is, bipolar disorder has a lot of the same symptoms as sleep deprivation, and it can be a difficult illness to diagnose. Bipolar I is classified as "manic depression," when a person's moods are extreme - high highs and low lows. According to the Mayo Clinic, symptoms of "mania" include being jumpy, increased energy or agitation, exaggerated self-confidence, decreased need for sleep, unusual talkativeness, racing thoughts, distractibility and poor decision-making. The depressive part of bipolar disorder is characterized by feelings of hopelessness, loss of interest, slowed behavior, fatigue, feelings of worthlessness and suicidal thoughts. Bipolar II is more common. Individuals with Bipolar II can be depressed for longer periods, according to the Mayo Clinic, and have at least one hypomanic episode (hypomania has similar symptoms to mania but are less severe and don't trigger psychosis, as is possible with Bipolar I). April Michael, author on bphope who lived with undiagnosed bipolar disorder for 10 years, wrote, "The average time it takes to receive a proper diagnosis of bipolar disorder is six years. ... The symptoms can vary widely and can often be either masked or exacerbated by other things." "The first step is to see a psychiatrist and provide them with a comprehensive personal and family history. ... It is important to rule out physical illness before diving into treatment with psychiatric medications. ... Be honest with yourself and your practitioners, be thorough in investigating all possible causes, and advocate for yourself to have the doctor spend as much time as needed to figure things out." This isn't my attempt to diagnosis Kanye because I am not a doctor. Considering lack of sleep can cause depression and bipolar disorder can cause lack of sleep, I can see how it's hard to tell what came first — the chicken or the egg. I just hope Kanye finds out what's wrong - if he needs medication, counseling or a few more hours of sleep every night. And, either way, this shows that we all could probably use some more sleep, even if you're not Kanye West. And...on that note...Goodnight!